While many of us are still waiting for 4G to become available on our network, in our area or just get a bit cheaper, the UK's only carrier to currently offer the service has found that Britain is riding the wave of technology like never before. 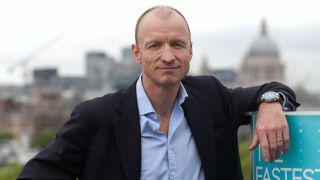 TechRadar spoke to EE CEO, Olaf Swantee, to discuss just how switched on, engaged and excited the nation is when it comes to technology. When asked if it was easy to get staff and the population as a whole energised about the 4G rollout Swantee explained: "It was amazing how quickly people were moving forward, it was really quite exciting, and they continue to do that." "The passion in Britain is just incredible, and when you compare that to other markets, for example Germany, it's harder over there," he said. "In Germany you plan, it takes a long time, but when it motors it motors like a train. "In the UK you have to kind of get the whole thing moving but then 'boof', everyone suddenly starts moving. That's good, and that's nice." It hasn't exactly been plain sailing for the folks over at EE though, with Swantee revealing that the infrastructure they had to work with really wasn't up to much compared with other countries. "In the UK the digital infrastructure - similar to others such as the airport, rail and energy infrastructures - is really quite poor. "Especially is you compare them to somewhere like Switzerland, the difference is really quite unbelievable. "In the UK people use more mobile stuff than in other markets, they are on the internet more than any other European market, they commute more and yet the digital infrastructure was way behind." "I think that in the UK, where the networks weren't as good compared to other markets, it was ideal to innovate with the network. "If you start innovating with the networks in Korean or Japan it's harder because the network is actually pretty good. "It's hard to innovate, but I'd say it's more fun and in the long run I think it's a more sustainable business model. If you are able to innovate and show differentiation many of your customers will stay with you." While the UK may be lagging behind in terms of its 4G service, Swantee believes it's getting to the point where it can start challenging global firms and push them to deliver the latest technology. "We're working with the ecosystem to drive the latest technology. For the first time I've seen a mobile network operator who is pushing the boundaries of the other firms in the industry. "We [EE] are pushing device manufacturers, asking where's your device at 150Mbps? We need CAT 4 devices. Qualcomm what are your plans? What are you doing, where is your chipset? "The same with transmission suppliers, BT, Virgin and others. Microwave suppliers, where are you going beyond 1GB? We may need it in two years, one year, three years, I don't know, but we're working on it now." So it seems that Britain is climbing its way to the top of the technology tree and if we all keep the passion that Swantee has described then, to borrow a phrase from one of EE's subsidiaries, the future's bright for tech in the UK.